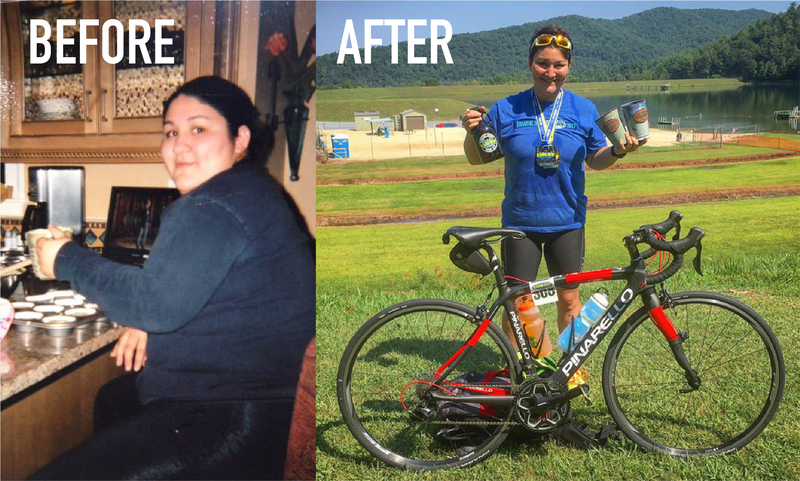 Lili Leonard has lost 100 lbs since she made it her goal to complete a triathlon. With her dedication and hard work she has come a long way from where she started when she could barely walk up a flight of stairs. This past weekend Lili completed her fourth Luray Triathlon Hawksbill Double, competing in two triathlons back to back with the Luray International Triathlon on Saturday followed by the Luray Sprint Triathlon on Sunday. With an inspiring story like that, we decided to catch up with Lili and ask her a few questions about her journey and her experience with the Luray Triathlon. I live near Frederick, Maryland with my awesome wife, our two dogs, two horses, 18 chickens, 3 geese and 2 turkeys! I work in fundraising at an LGBT health care organization in Washington, D.C., so I get the best of both worlds – city life and country life! In 2006, I weighed 270 pounds. I always felt like a triathlon was the pinnacle of fitness, so as I began to lose weight, I made it my goal to complete one. I lost 100 pounds, and finished my first sprint triathlon on June 20, 2010. I’ve been hooked ever since! I was looking for scenic, well-supported triathlons within driving distance of the D.C. area. Luray was the perfect fit! What made you decide to do the double? I mean, who doesn’t want to do that last hill twice?! In all seriousness, though, this weekend is always a great mental challenge for me. The phrase I kept at the front of my mind this year was something that came to me during the swim on Saturday: this weekend is the physical manifestation of mental toughness. It is absolutely one of my favorite weekends every year. The town, the volunteers, the course… everything about it is perfect. My work commute is pretty long (about 90 minutes each way.) Because of that, and the fact that I’m in school for my doctorate, training time is pretty limited! I build workouts into my commute by taking the train and riding my bike the rest of the way into work, which ends up being a 13-mile round trip. Every race I compete in is a reminder of how far I’ve come from the 270-pound person who could barely walk up a flight of stairs. Tell me about your Luray Triathlon race weekend experience. It was an amazing weekend. We stayed at a local B&B where we were greeted with carrot bundt cake and coffee, so I was pretty much in heaven! Packet pick-up was seamless, as always, and I was pumped to see the super comfortable race shirts make their return this year! The best thing about staying in Luray is that because the town is relatively small, no matter where you’re staying, it’s a 10-15 minute drive to the race site. This makes for a low-stress race morning. We pulled up at 7:15 a.m. and I was body marked, timing chipped, and set up in transition by 7:29! Swimming in Lake Arrowhead is always wonderful. This year, it felt like getting into a bathtub! I love the calm and clear water. The bike course: my favorite. Technical, with lots of false flats that make you wonder if you’ve lost your mind. Sure, there are hills, but the best part of those is getting to race down them! I hit 44 mph this year! The run is straightforward and offers a good amount of shade to recover from the intense sun! I cut 18 minutes off my Double time from last year – that was pretty cool! Honestly, every race I finish is a goal reached. The range of emotions and thoughts I experience during a triathlon reminds me that I’m alive! Sure enough, on Sunday, as I finished up the bike and began the run course, she was standing on the side and shouted to me, “I’ve got your diet coke for you when you finish!” I didn’t think she was serious… until I went to her after the race and she pulled two ice-cold diet cokes from the freezer for me. Is there ANY other race where that would happen? I don’t think so! Will you participate again? What keeps you coming back? I can’t say enough about the good energy of this race. The volunteers are always amazing, the town is so welcoming and friendly, and the race itself is top-notch. I will be back! I’ve got Sea Gull Century (100-mile bike ride in Maryland) coming up, as well as the Marine Corps Marathon! Do it. Whether you’re signing up for your first sprint, or your 50th international, or your fifth double, this race will provide a high level of support, a challenging-yet-achievable course, and completing Luray will be something you will be proud of. I’m not a top finisher by any stretch – for me, this weekend isn’t about the perfect bike split or a lightning-fast 10K run. It’s about pushing myself physically and mentally, celebrating the achievement of finishing, and enjoying the moments of peace. I’ll see you out there in 2018! Such an amazing story! I watched my daughter, Sarah Reed, compete for the very first time this year and watching all the athletes come racing in at the end was very exciting as a spectator!! As a heavy set female myself, I don’t believe there is any possible way I could ever finish a triathlon. Although Lili, your story truly inspires me to become more physically fit! Great job!! You are amazing!! !